Finfeed presents this information for the use of readers in their decision to engage with this product. Please be aware that this is a very high-risk product. We stress that this article should only be used as one part of this decision-making process. You need to fully inform yourself of all factors and information relating to this product before engaging with it. 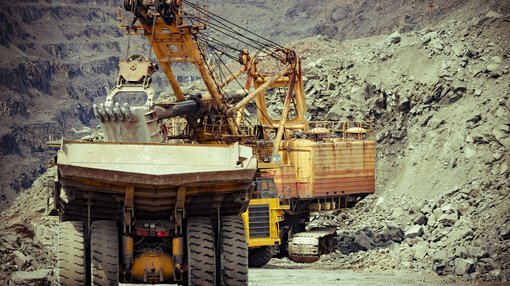 Mustang Resources (ASX:MUS) has informed the market it has received strong results from preliminary ore sorting testwork conducted on drill core from its Caula Graphite-Vanadium project in Mozambique. The testwork demonstrated that the Caula ore is highly amenable to sensor-based ore sorting, showing that an ore sample with no visible waste could be split into high-grade and low grade streams. Both X-Ray Transmission and Conductivity-based (EM) sorting were evaluated through testing, with the EM sorting producing the best result for MUS. EM sensors assess the amount of electrically-conductive mineral (for MUS’s purposes, graphite) in each rock particle. The company also stated that vanadium values are closely associated with graphite and show a similar response to sorting. Sorting ore saves a company costs by rejecting waste rock and low-grade ore ahead of expensive processing steps such as milling and froth flotation. In many cases, sorting delivers additional environmental benefits to projects due to reduced tailings volumes, enhanced tailings storage stability and other factors. High capacity, sensor-based ore sorting is an emerging technology which can deliver enormous value, particularly when considered for a new mining project. The preliminary ore sorting test work was conducted by specialists TOMRA, at its Test and Demonstration Centre at Castle Hill, NSW Australia. In short, the tests found that in a full-scale mining operation, EM sorting would efficiently reject barren waste with minimal loss of graphite or vanadium values; successfully split a moderate-grade ore sample with no visible waste into high-grade and low-grade fractions; and, the potential to use ore sorting to upgrade graphite and vanadium grades. It should be noted it is still early stages here, so investors should seek professional financial advice if considering this stock for their portfolio. The results demonstrate the potential to increase production rates without increasing the plant size and to reduce operating costs. With such strong results, TOMRA has recommended a larger-scale formal test work program. TOMRA has an extensive record in the mining industry relating to sensor-based sorting installations operating at feed rates ranging up to several hundred tonnes per hour, with full automation and thus very low costs per tonne processed. The Caula Project is located along strike from Syrah Resources’ (ASX:SYR) world-class Balama graphite project in Mozambique. The sample selected for the ore sorting test work was a continuous portion of quartered NQ diamond drill core from 58m to 88m downhole. The sample was selected as a representation of fresh ore with moderate grades of graphite and vanadium and no visible barren rock intersections. The quarter core sample, total weight of 66kg, was broken into approximately 50mm lengths, then split into two portions using a rotary riffle. Subsequently, one of these portions, with a weight of about 30kg, was sent to the TOMRA Test and Demonstration Centre. 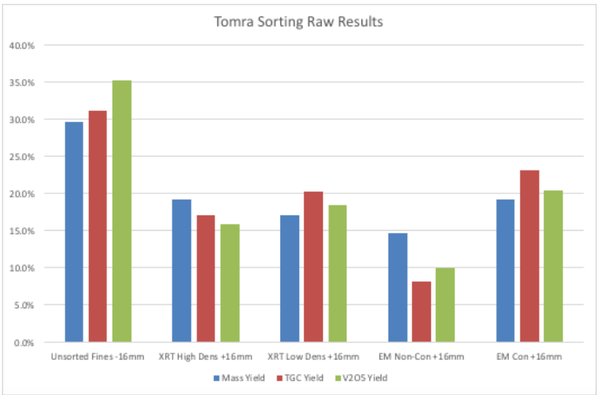 At TOMRA, the sample was screened at 16mm to remove ‘fines’ ahead of sorting tests. The ‘screen oversize’ was then subject to sorting tests on both XRT and EM based machines. Analysis samples were then split out and sent for graphite analysis, multi element XRF analysis and semi-quantitative XRD mineral analysis. The mass split and the distribution of contained graphite and vanadium between the five samples is shown below. 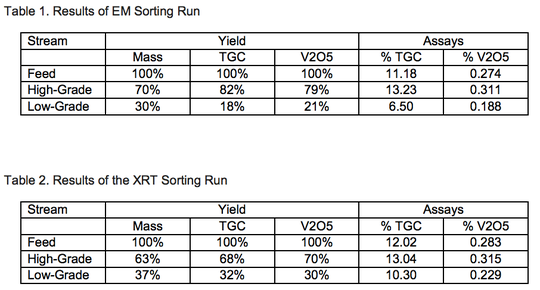 As shown above, EM sorting achieved greater levels of separation of graphite and vanadium values than the XRT sorting. Comparative results are also shown in the tables below.